"David Devriès…exemplified the art of the French ténor-légère. As did Edmond Clément and the ill-fated Louis Cazette, he exhibited in his singing the elegance, style and good taste that has seemingly been eroded during the last half of the 20th Century." 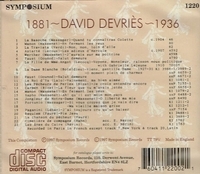 "David Devriès was an exceptional French lyric tenor, one of the best of an extraordinarily talented group in the first three decades of the century. He had exemplary vocal production and flexibility…accompanied by an unusually warm tone for a French tenor. The flicker vibrato might put some off, but there’s no denying the honeyed sound and the serious art of this singer."